Discussion in 'UFC Discussion' started by Garviel, Jan 4, 2013. He really does come of like a non-materialist. However I serisously doubt it was Gunnar formalizing those sentences. Not due to its content or how it was phrased. I just can't belive that Gunnar would ever say that much ever. huge fan. one of my favorite young up-and-coming prospects. 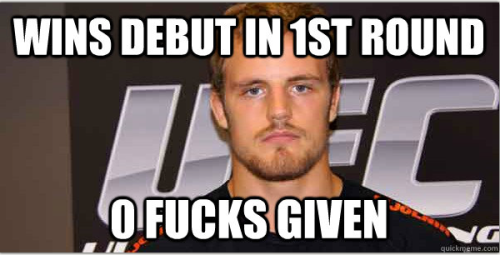 I can't wait to see Gunnar have his next fight. Gunnar seems like a cool guy. Very promising skillset, too. dont think he will have much success. he looks well rounded at first but the more you examine you see the flaws. undersized, his standup is so so, his wrestling is so so, but great ground game. not a good combination for the WW division. in another words an inevitable LW. where I think he would do much better. His stand up is better than "so so", not sure how his wrestling is but his ground game is phenominal and should compensate, he out grappled Jeff Monson! Probably pieced together from five weeks of interviews, observation, and a team of body language experts. Gunni is young and Damarques didnt make weight. His karate is great. His footwork and movement also. Actually strikingwise he is good. Just his punches that are not so tecnical.